Most outdoorsmen have a machete or other blade of choice. However, not all are familiar with the fierce Nepalese kukri. This unique blade has been honed over generations of use in battle and in everyday life. Its angled blade and curved design combine the accuracy of a knife with the performance of a hatchet. The resulting fusion of durability and flexibility has made it an extremely popular survival machete. While some swear by traditional khukhris or specific brands, choosing the best kukri depends on how you plan to use it. Accordingly, you should research your options before choosing the right blade for you. The kukri has unique histori﻿﻿cal roots. In particular, this mid-length curved blade is the national knife of Nepal and a cultural symbol of strength and unity. Such values have become attached to the kukri mainly due to the nation’s respected Gurka regiment. This celebrated branch of the British military has a long history of fierce fighting, as explained in this video from Seeker Daily. Each Gurka soldier has and continues to place a great deal of value upon their standard kukri. It is their weapon of last resort, to which soldiers turn when hand-to-hand combat is the only option left. Going back to at least 1627, its unchanging design of a curved and heat-tempered blade has been passed down among the Kami clan of blacksmiths. They continue to make some of the world’s best kukri from metal, wood, and bone. In part, this is because of the kukri’s association with the Hindu Dushain festival, as well. This blade has long been valued for its extremely keen cutting edge. Historically, Himalayan hill farmers have used it for cutting vegetation, shaping timber, and chopping food. At only 1 to 2 pounds and 14 to 16 inches, the kukri allows for optimal force as an extension of one’s arm. As such, it is simultaneously an essential tool and weapon. Among outdoors enthusiasts and others, the kukri has also recently become popular for self-defense. In large part, this is because of its superior weight and handling. These factors make the kukri practically un-parry-able by swords, rapiers, and other blades. In particular, the kukri’s compact design is defined by an ideal balance of weight. Unlike many other knives, this blade shifts its weight forward in the handle in order to improve handling. Whether you are using it to chop through a crowded forest or cut up food, its enhanced balance ensures optimal performance. Yet, this blade was also historically designed for battle and used to thrust, chop, and cut one’s enemies, as demonstrated in this video. Similarly, an indentation above the handle prevented blood from reaching it. The kukri also includes two small knives on the scabbard: the blunt Chakmak for striking flints and general-purpose Karda. As it has spread around the world, the kukri has also changed in style. In general, most designs will fall into one of two categories defined by the blade thickness. 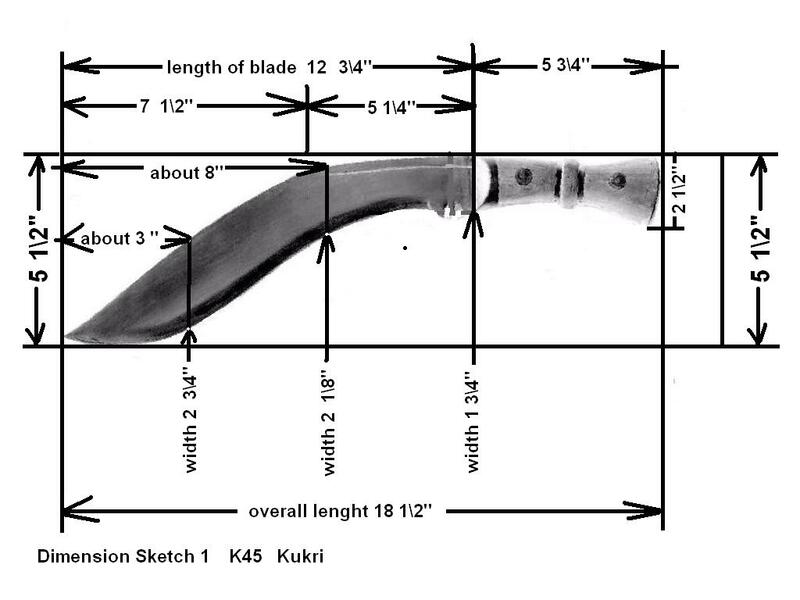 While Eastern or Sirupate kukri are thinner, Western or Budhuna knives are broader. Both styles maintain this blade’s flexibility and durability as a combat and utility knife. Determining the best kukri for you will depend on your intended use for it – whether for clearing paths while hiking or more everyday applications. Different applications require different sizes and weights. While thin, long ones can be used like a machete, smaller kukris are multi-purpose tools. Kukri blades are usually high carbon steel due to its durability. If you plan to use your knife in the great outdoors, look for one that will not dull or rust easily. Alternately, you can use grease or oil to maintain your blade over time. Materials vary from ivory to wood and modern polymers. The key issue here is getting a good grip to maintain control. For most of the best kukri, in particular, the handle will be curved to keep your hand in place. This is the dull part of the blade that extends into the handle. Traditional kukri blades have little to no tang. However, a full tang increases durability, which can be especially helpful when chopping harder materials. This aspect is often overlooked. Your sheath should be as high-quality as your actual knife. Otherwise, you are putting your own and others’ safety at risk, especially with traditional models’ often minimal sheaths. This is the sign of a true kukri blade. Although many have been confused by this notch in the shed, it actually works as a shock absorber. This allows the hard steel to flex upon impact and avoid breaks. You should also consider materials, cost, and the proper way to use a kukri. In particular, you can consult the guide linked above for tips on how to use this powerful weapon appropriately. For instance, you should let your wrist go when going to chop, cut, or hit. 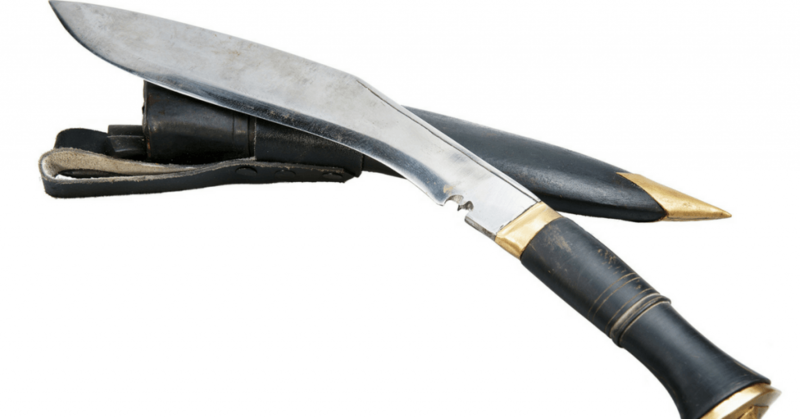 With some training, you can wield this all-purpose survival weapon with ease. Each of the following kukri blades stands out for their fusion of durability and flexibility. At the same time, each also stands out for a particular set of needs – whether that be high-quality steel, inexpensive costs, or various others. 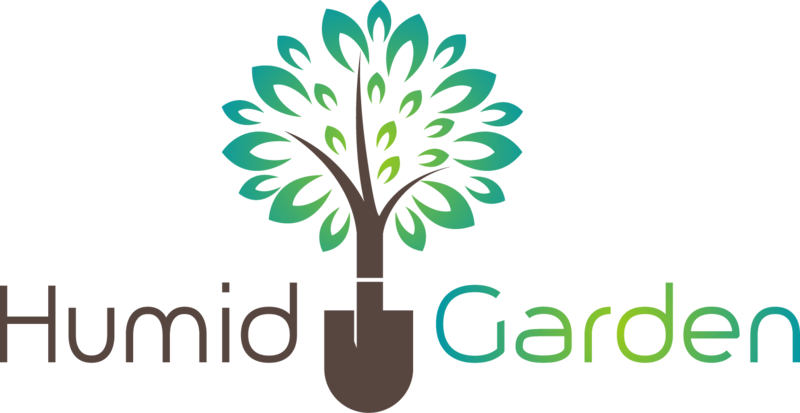 Consider how each of these best kukri blades can fulfill your gardening, adventure, and even self-defense needs. The resilient Ontario 1064206 merges together a traditional kukri and a machete. In particular, this American-made blade measures in at 17 inches in length, with 11.5 dedicated to the blade. 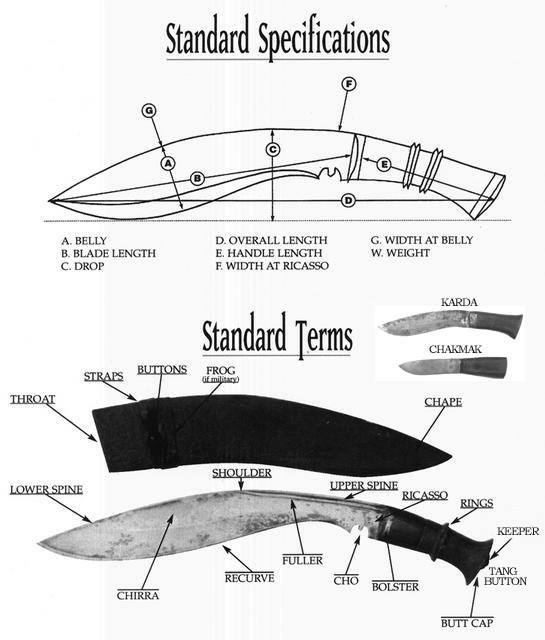 In contrast, survival-oriented knives will generally have slightly longer blades, while this kukri’s spine is slightly wider than similar models. The latter allows for strong performance, whether you’re using it every day use or just to cut through jungle vegetation. Its quarter-inch blade of 1095 carbon steel enables better chopping power than a hatchet. An additional black epoxy powder provides protection from rust and wear. However, regular cleaning and oiling will extend its life. The Ontario 1064206 includes a rubber Kraton handle that helps you maintain a comfortable grip, with a lanyard hole for a wrist strap. Although the handle loses some comfort to two small hand guards, its real fault is the sheathe, which provides only minimal protection. However, overall, this kukri remains light, durable, and inexpensive without impeding performance. This is another kukri-style machete with a high-carbon steel blade. It includes a full tang to ensure decent chopping power, but the Ka-Bar 2-1249-9 is not suited for combat as a result. Still, this is a workhorse of a kukri that can quickly clear thick overgrowth. This highly durable model is able to take on the work of an axe or small hatchet with ease. The 2-1249-9 is a multipurpose blade; in particular, its light weight and 11.5-inch length make it ideal for backpacking. Furthermore, a keen cutting edge of high-quality steel ensures your safety while chopping wood, clearing a campsite, or fending off animals. This model also comes with a leather combination sheath for accessibility. This blade’s few limitations include the lack of a lanyard and the need to maintain the 1085 carbon steel over time, as its coating wears away. Like the Ontario model above, Ka-Bar’s blade sits in the middle price range. However, Ka-Bar has a stronger reputation for high-quality, American-made blades among military and service groups. Unlike the machete-style kukris above, the ﻿﻿﻿Cold Steel Gurkha Kukri Plus knife mixes traditional and modern ideals. In particular, its precision-ground blade is very thin and sharp at 5/16 of an inch thick and 17 inches long. This includes a full tang design that helps the Gurkha Kukri Plus cut through vegetation with ease. This model includes a Kraton handle, extra-comfortable grip, and blade guard to ensure traction and protect against injury. However, the provided sheath is again poor quality. In this case, the Kydex sheath is a snug fit, but one that can easily trap moisture or debris and lead to more damage to the blade. This 12-inch blade with a 6.4-inch handle weighing in at a light 1.44 pounds is the most compelling budget kukri on the market. The Schrade SCHKM1 Full-Tang Kukri starts with a 1/8-inch, 3Cr13 stainless steel blade with rust resistance. This includes a full tang with a larger curve than most kukris and a soft enough steel to withstand high impacts. On top of its in-built versatility and power, the SCHKM1 is also easy to maneuver. Schrade’s Safe-T-Grip handle is composed of hardened and rubberized plastic with tiny lines to better your grip. At the same time, its ergonometric design leaves an additional 1.5 inches of steel near the grip unsharpened to prevent injury should your hand slip. The SCHKM1 also includes a lanyard hole and polyester sheath with removable storage pouch and the potential to hook to your belt, strap to your leg, or be carried in a sling. This knife may seem ideal for those on a limited budget. However, despite an added, black powder coating, this kukri still requires regular maintenance. 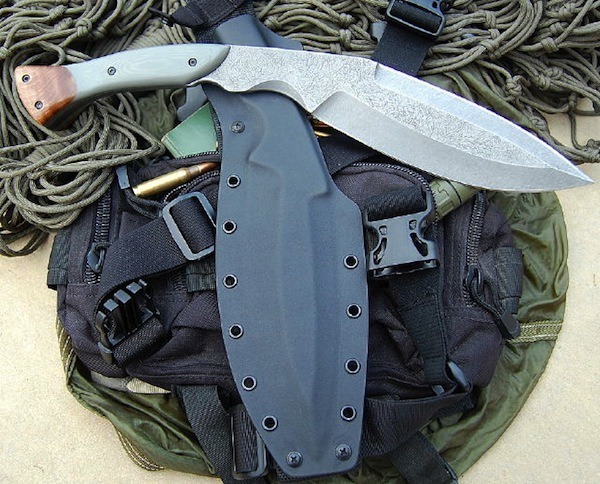 When Alan Kay used it to outlast the Pacific Northwest on the show Alone, the Condor Heavy-Duty Kukri gained many new fans. Between unique materials, a distinctive finish, and even blade grind, Condor’s model comes the closest to an authentic khukhri from Nepal. Yet, it is an inherently modern creation produced in El Salvador by Joe Flowers. This heavy-duty kukri’s 1075 carbon steel cutting edge is razor sharp at 5/16 of an inch and 15 inches long. It outweighs models like the Cold Steel knife above but can cut through small branches with ease – making it ideal for trail-blazing. While its weight can cause problems over long periods, the blade’s convex grind ensures a superior grind without drag or sticking. Condor’s mode﻿﻿﻿l is distinctly compact with a full tang for performance. In addition, its durable materials make the blade almost impossible to chip, much less break. The included leather black sheath is more traditional than most. Yet, its generous-sized belt loop, thick walls, and easy-to-use snap lock make it one of the best on the market. Each of the above blades offers a particular set of advantages. However, when it comes down to performance, the field quickly narrows to the Ontario﻿﻿ 6420 and Condor Heavy-Duty kukri. From there, it’s more a matter of your specific plans for your new knife and whether you can afford to discard the Ontario’s low-quality sheath. Whatever your plans, be sure to research the blade, handle, tang, and sheath – along with the related materials, cost, and otherwise. Doing so before you make your investment will ensure that you get the best kukri for you. Investing in this important tool is not a decision to be rushed; so, take your time, and consider the available options..